On January 21, America will pause to remember the life of Martin Luther King Jr., an influential man who not only served his country well, but inspired many generations to do the same. 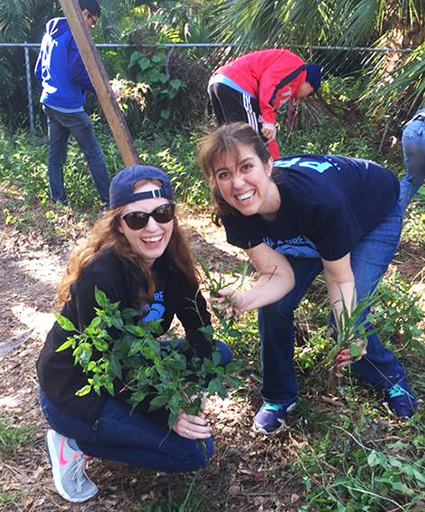 Stirred by King’s servant heart, every year on MLK Day, Palm Beach Atlantic University students, faculty and staff join volunteers from the United Way of West Palm Beach, Aramark and AmeriCorps to work on service projects around its community. A grant from the Corporation for National and Community Service and Points of Light support the projects, which take place in various Palm Beach County locations, including Dreher Park, farmers’ fields and more. Through PBA’s Workship program, students have contributed more than 3.1 million hours of service since the University opened in 1968. Workship is a distinctive community service program that responds to human needs with Christ-like action in the community and the world. Registration and opening program begin on Monday, Jan. 21, at 7:30-8:00 a.m. in the Rubin Arena of the Greene Complex for Sports and Recreation, 1100 S. Dixie Highway, West Palm Beach. This is followed by worship, which is led by The Anchor, at 8:00-8:30 a.m. All projects commence at 9:30 a.m. and end at 12:15 p.m. at work sites, unless otherwise noted. For more information, please contact: Director of Workship Kate Magro, (561) 803-2595, cell (304) 281-3045.